Four days remain before the deadline to keep the government funded and avoid a shutdown and lawmakers are at odds over how to move forward. But even with the clock ticking, the GOP is focused first on getting its tax legislation to President Trump's desk. House Republicans unveiled a measure last week that would provide new funding to defense programs through Sept. 30, 2018 and keep the rest of the government funded at lower, existing levels through Jan. 19, 2018. The bill has been saddled with the clunky name of "CRomnibus" by lawmakers and their staffers because it includes a continuing resolution (CR) for most of the government and an omnibus, with new funding, for defense programs. May 4, 2017 -- Congress passes $1.1 trillion spending deal that funds government through Sept. 30, excluding funding for the border wall. Sept. 8, 2017 -- Trump signs government funding measure, that maintains 2017 levels and funds the government through Dec. 8. Sept. 30 -- The two-year budget deal signed by Obama in 2015 expires, paving the way for the 2011 spending caps to take effect. Oct. 1 -- New fiscal year 2018, begins. 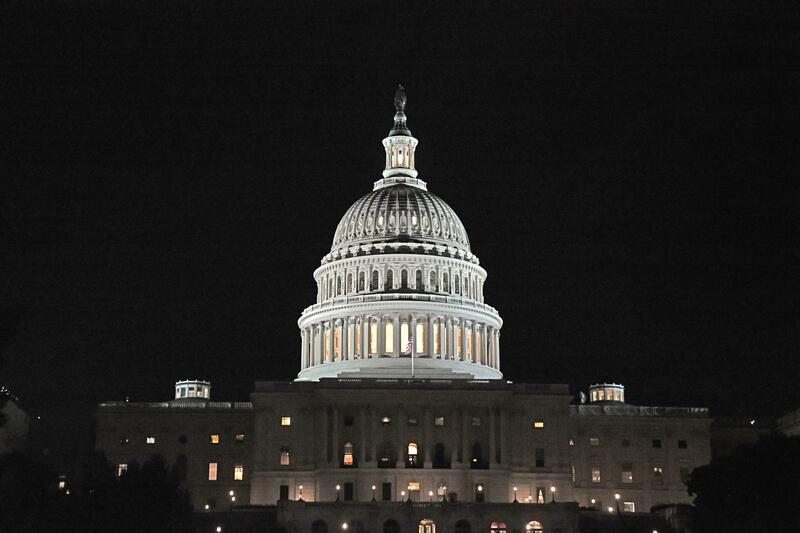 Dec. 7 -- Congress passes short-term spending bill through Dec. 22. Dec. 22 -- Spending bill expires; new bill needed to avert shutdown. Jan. 19 -- Expiration date for part of House GOP "CRomnibus" proposal. Not to be outdone, Democratic leader Nancy Pelosi rejected the CRomnibus by rattling off a couple of her own names for the bill. "Some people are calling it the 'punt'-ibus, just punt this down the road. I call it the 'none'-tibus because it's not going anywhere," said Pelosi at her weekly news conference last week. "It's not going to fly. We can't support that." Democrats are using the leverage they have to strike a deal that would lift spending limits on both defense programs and non-defense domestic programs, reauthorize the Children's Health Insurance Program (CHIP) and include the proposal from Sens. Lamar Alexander, R-Tennessee, and Sen. Patty Murray, D-Washington to extend Obamacare's cost-sharing reduction (CSR) payments for the next two years and eliminate the question about whether making the payments is legal. The White House announced earlier this year that because there was no congressional appropriation for the payments -- which help keep insurance affordable for Americans buying in the individual marketplace -- it would stop making the payments. Top congressional leaders are negotiating with the White House over a budget deal that would lift spending caps that came back into effect on Oct. 1. These were limits set by the Budget Control Act (BCA) of 2011, to help keep deficit spending in check. Congress has twice passed similar agreements over the last four years. In 2013, Rep. Paul Ryan, R-Wisconsin, then the chairman of the House Budget Committee, reached a deal with his Senate counterpart, Sen. Murray, to boost spending caps for two years. Once that deal expired, Speaker John Boehner, R-Ohio, reached a deal with Democrats and the White House in 2015 to lift spending caps for two more years. That deal expired Sept. 30 of this year. Republicans and Democrats are currently eyeing a two-year budget deal that would lift spending caps by $200 billion, according to a source familiar with negotiations. The disagreements between the two parties could lead to some legislative ping pong between the two chambers. As of Monday, House Republicans are still planning to bring their proposal to the floor for a vote and send it to the Senate. Senate Democrats would then block the measure because it requires 60 votes to advance in the upper chamber and there are only 52 Republicans, and no Democrats who will support it. Senate Majority Leader Mitch McConnell, R-Kentucky, will likely have no choice but to give in to Democrats' demands and strip out the defense portion, and send it back to the House with additional provisions. McConnell vowed last week that Republicans wouldn't allow the government to shut down. "There isn't any chance that we're going to shut the government down," the Kentucky Republican told reporters at a press conference. "I think the American people need not worry that there's going to be any kind of government shutdown...I sense the Democrats don't want to do it and we don't either." Senate Minority Leader Chuck Schumer, D-New York, said that the conservative Freedom Caucus in the House had been pushing a "CRomnibus." Schumer said that Senate Democrats will quickly reject such a proposal if it comes to the Senate floor for a vote. "[Paul Ryan will] be walking right over the cliff to a Republican government shutdown," Schumer said. Meanwhile, Republicans are primarily concerned with getting their tax bill over the finish line. House Republicans will meet Monday evening to discuss the final agreement and are planning to hold a final passage vote early Tuesday afternoon, and sending it immediately to the Senate, where it's expected to pass with the necessary simple majority. "The entire focus this week will be the votes on the tax bill," said Bill Hoagland, senior vice president at the Bipartisan Policy Center. "I think what they'll end up doing is a very simple continuing resolution going through the holidays, maybe until as far as January 19." A Democratic leadership aide told CBS News that Republicans have been reluctant to agree to anything until the tax measure is done. The aide said that negotiations over a deal to lift funding ceilings and to find a legislative solution for so-called "Dreamers" are going well but it's unclear how quickly it can come together. Separately, a senior House Democratic aide said that bicameral talks on a budget deal to lift spending caps are being slow-walked by Republicans because they are worried about impacting the tax bill vote. The aide said that it would be a waste of time for House Republicans to vote on the CRomnibus because Senate Democrats have already dismissed it. While the deadline is quickly approaching, odds of a government shutdown remain slim, experts say. Hoagland says Republicans wouldn't want a shutdown to mar their tax bill victory. "They want the focus to be on the success; not the failure and government shutdown is failure," said Hoagland, who said Republicans would be largely blamed if there is a shutdown. "For the average American out there, they say, 'Wait a minute you guys are in charge of both the House, Senate and White House, you shut down the government?' Another black mark for Rs, which they don't need."